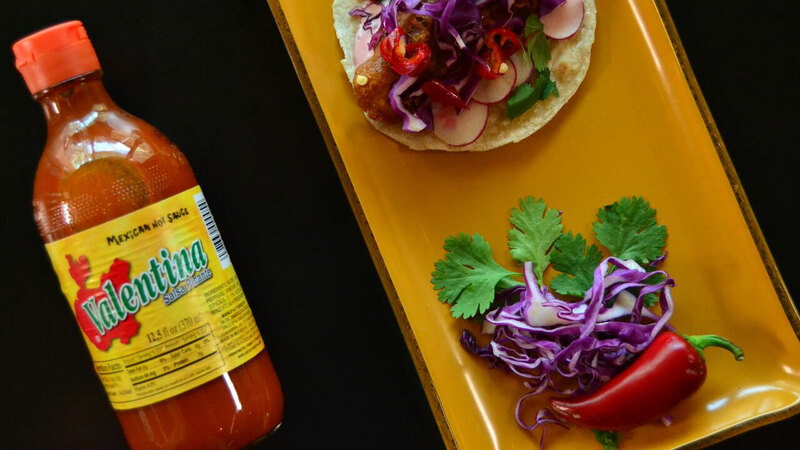 At Austin Taco Project, there’s a science to matching your taco with the perfect hot sauce. “Tacos every day” is an ideal we can all support, but in Austin, Texas, tacos are a legitimate lifestyle. 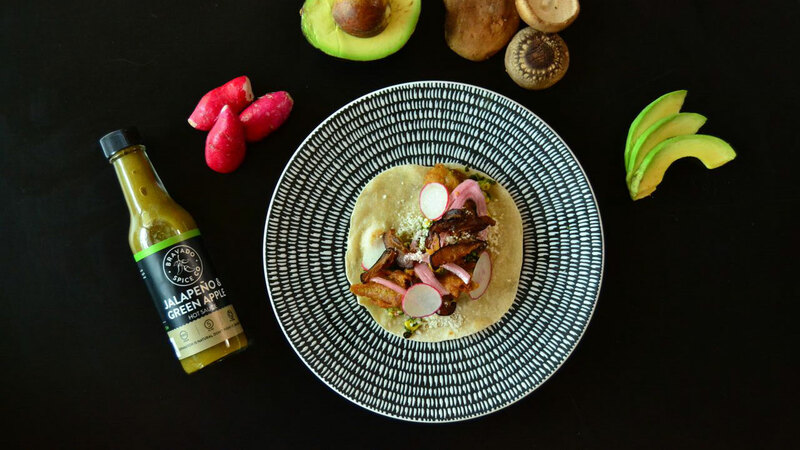 Austin Taco Project, a recent addition to the city’s bustling taco scene, calls its executive chef, Kevin Spencer, a “tacologist,” and even staff are trained to give expert advice on taco and hot sauce pairings to maximize the flavor profile of each dish. A hot sauce caddy sits on every table, containing options from around the world. Think Sriracha from Thailand, Crystal Hot Sauce from Louisiana and Valentina from Mexico, which Spencer proclaims is “the duct tape of food” because it can go on anything. 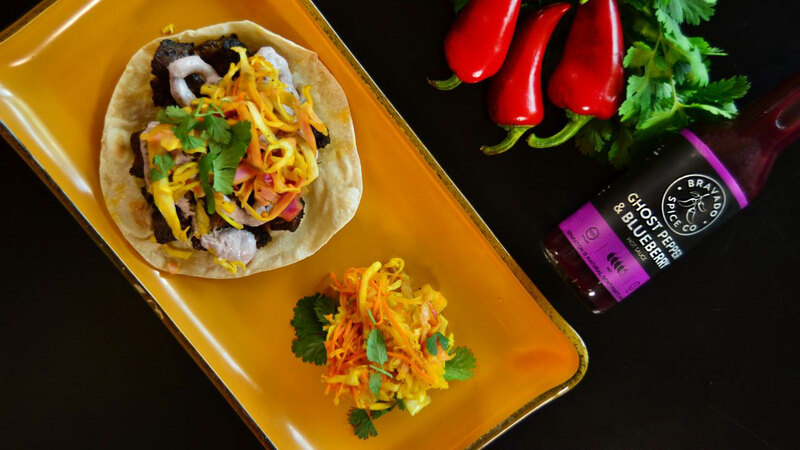 You’ll also find the local Texas staple, Bravado Spice Co.
You don’t need to eat at the restaurant to apply the staff’s pairing tips to your own Taco Tuesday gathering. “A sauce can completely change the taste of any dish, and pairing two flavors together can be magic,” Spencer says—and this is especially true of tacos and their condiments. Here, the chef offers expert tips for creating magical taco and hot sauce combinations with stuff you’ve got in the fridge. The taco al pastor, with its spit-grilled meat and juicy pineapple, is the unofficial king of the taco universe. 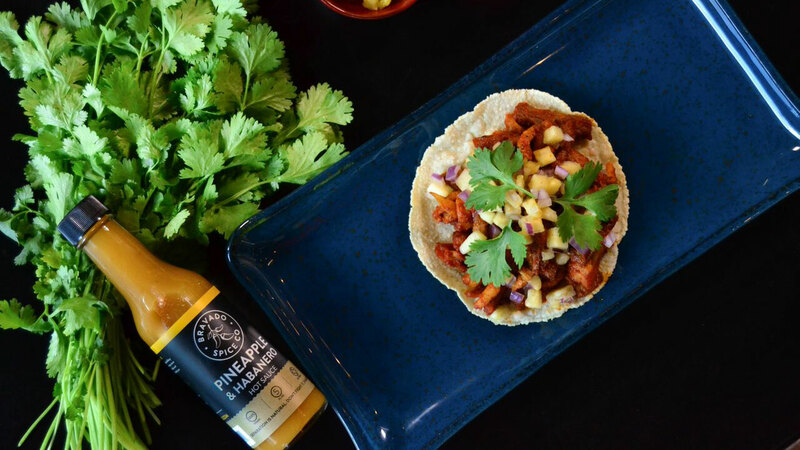 Spencer’s Pineapple Express, which uses pork belly instead of the traditional shoulder or loin, pairs beautifully with Bravado Spice Co.’s Pineapple & Habanero hot sauce. “The pineapple flavors in the taco lend itself to a great pairing with pineapple and habanero—the fruit in the sauce tones down the heat for an enjoyable match,” he says. At home, “venture into your local grocery store and pick up a pineapple hot sauce—there are a lot out there,” he says. If pineapple isn’t your thing, Spencer suggests Valentina Salsa Picante or any Cholula flavor. The Wake Up!! taco, compiled of chili and coffee-smoked brisket, is one of Austin Taco Project’s best-selling tacos, and they pair it with Bravado’s Ghost Pepper & Blueberry hot sauce, where the fruit doesn’t simmer down the heat but rather adds a strikingly complex flavor profile. “If you are making brisket or steak tacos at home, I always go for a verde sauce or something a little more vinegar-forward,” he adds. Frank's RedHot, Crystal hot sauce, and DL Jardine's Texas Champagne sauce are all great choices here. It’s okay to get a little weird when working with off-beat vegetarian tacos. Spencer’s P.E.T.A taco, filled with beer-battered avocado, veggies and cheese, has a lot going on, but “still plays well with others.” Spencer pairs it with a hot sauce made of jalapeño and green apple. 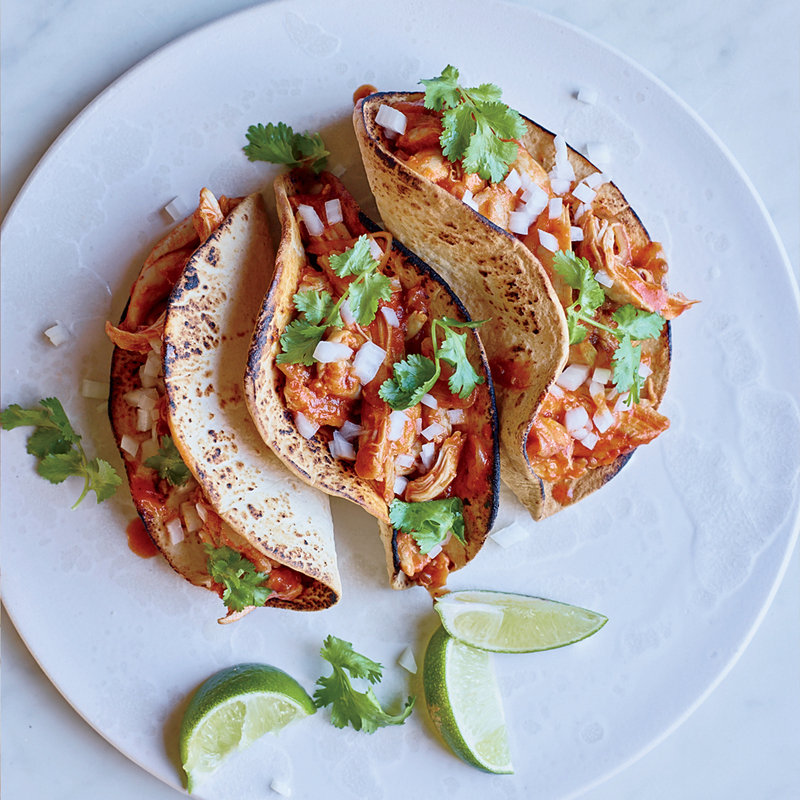 “Tartness from the green apple helps take this taco to umami town,” he says. Fruit-forward red and green chiles are good ingredients to look for, as well. For the slightly heat-averse taco lover, Spencer recommends Crystal hot sauce. 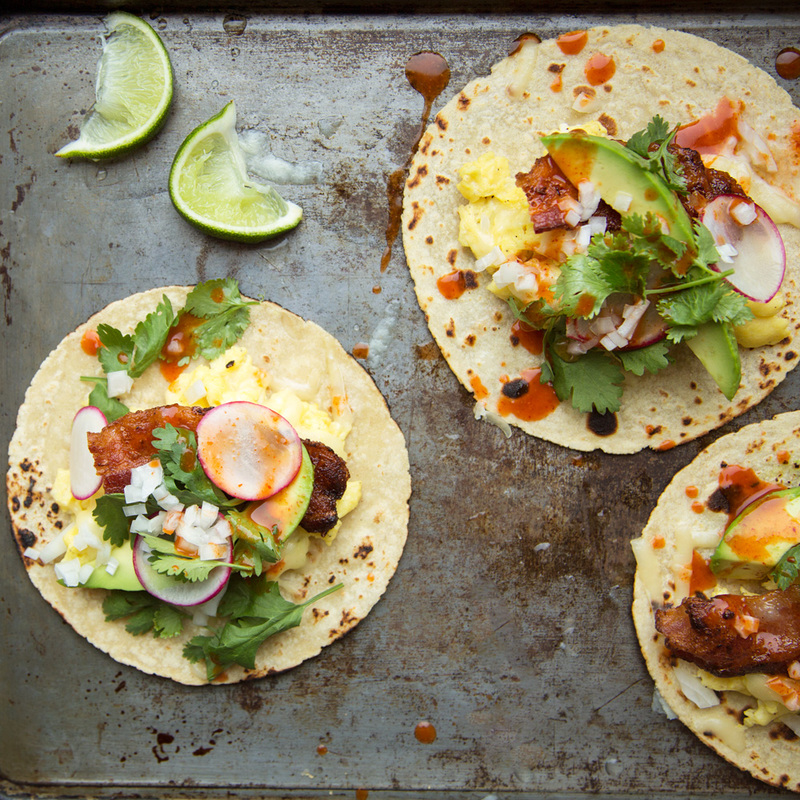 As you probably could have guessed, most hot sauces work splendidly with breakfast tacos. The spicier, the better—a little kick with your morning coffee is an energizing way to start the day. “Breakfast foods were meant for hot sauce,” Spencer says. 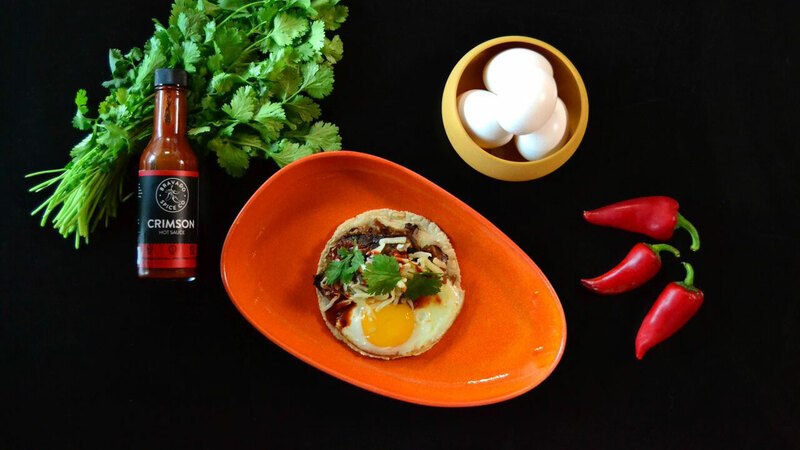 His Wilbur ‘n Huevos taco—stuffed with Cuban-style Mojo pork, a sunny-side up egg, árbol salsa and Oaxaca cheese—is a solid match with Bravado Spice Co. Crimson hot sauce. Its red jalapeño and árbol chiles work well with pork and the “sweet creaminess” of the egg yolk. Not in your fridge? Don’t fret. Valentina, Cholula Chili Lime Hot Sauce, Frank's RedHot, Tajin or verde (green) hot sauces are winners here, too.